For the last few weeks both of my children have been having a routine shift with math. 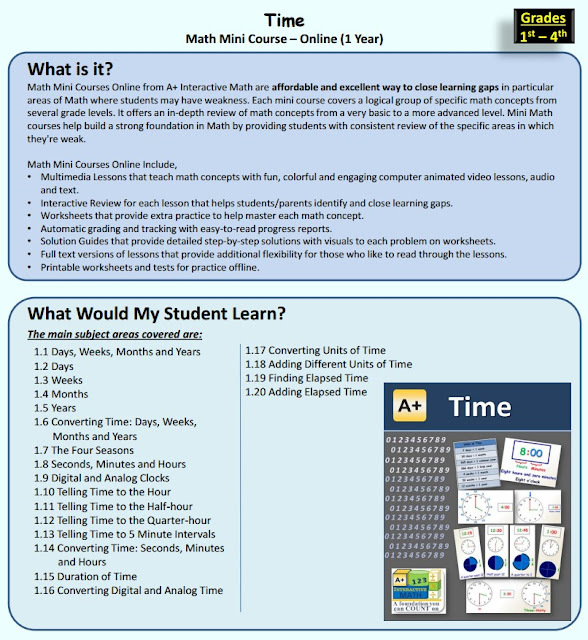 We have been reviewing the Math Mini-Courses from A+ Interactive Math. There are 20 Math Mini-Courses available and the course is available to you for a year. The prices ranger from $9.99 to $19.99 and each course can be completed in just a few months. Sebastian, doing work at a fourth grade level, has never done much with Ratio, Proportions, Probability & Statistics, so I took the chance at having him take the Mini-Course to expand his knowledge in this area. He has done multiplication and division, but hasn't worked with fractions yet so I thought this might be a nice precursor for next year's math work. It is nice to be able to fill in a gap with a course that is fairly short and to the point. There is an overview and plenty of practice on each concept presented. Kaelyn is doing kindergarten math but hasn't had much work with time. I saw that it would go over days, weeks, months, and years and thought that would be good to go over with her. Since the courses are read to her, I didn't have to read or do much with her. I sat with her during the lessons and helped her with the quizzes, but she could be independent with it. It is flexible for ease of use in many homes. You can do it all online, but there are worksheets and tests that can be printed if you prefer pen and paper work. Each lesson is a read aloud to the student with visuals used throughout the presentation. 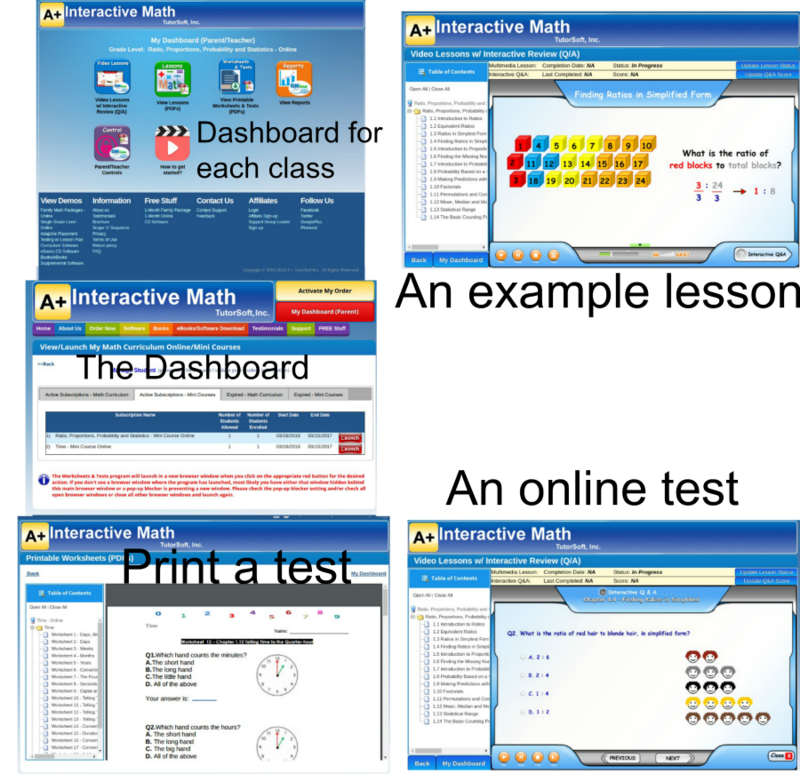 After the lesson they are given an interactive quiz where the questions and answers are spoken aloud and the student chooses an answer from multiple choices. If the answer picked is incorrect, the student is brought back to that part of the lesson for review and then they can pick another answer from the list. Time table is set by you! Kaelyn thought it was a lot of fun. You had the option to print out worksheets and tests so it didn't have to be 100% online. When you go something wrong, it would go over that part of the lesson and Sebastian felt it was dragged out too long. Sebastian wanted it to go faster, but the lesson only has one speed. If you know the answer, you still have to wait for ALL the answers to be said before you can check it. In general, Sebastian just wanted to go faster. He thought the lessons were too slow. But that is Sebastian for you. He wants all of his school to go fast. Who would this be ideal for? Someone struggling with a specific math concept. There is so much review and practice that it would help those that just aren't quite getting it. Someone who struggles with reading. Since the lessons are read aloud to the students, there is no need to read. Even the tests are read aloud! 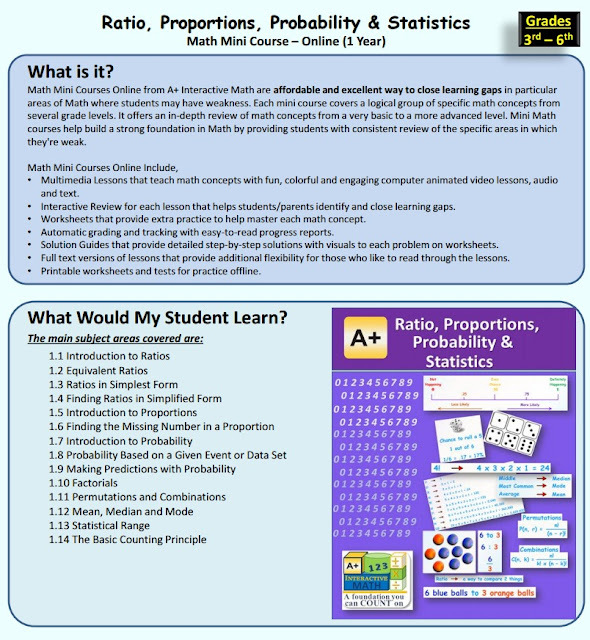 Anyone who likes online learning. Someone who wants to learn independently.